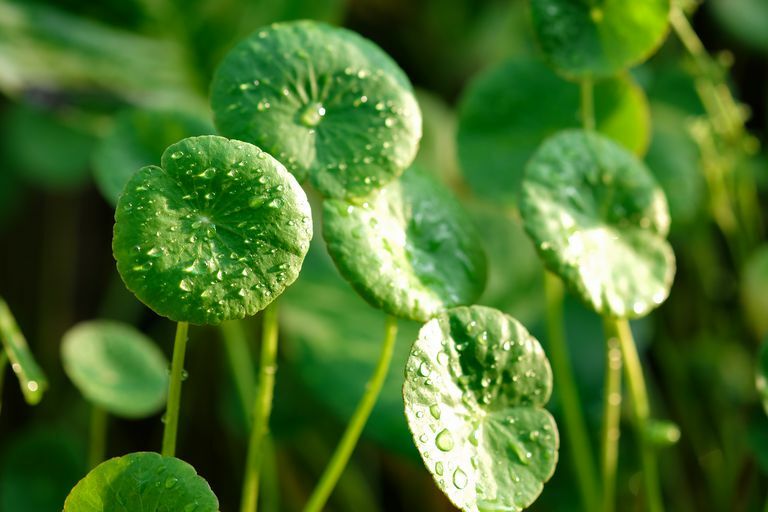 Gotu kola (Centella asiatica) is a type of leafy plant traditionally used in Asian cuisines that also has a long history of use in both traditional Chinese medicine and Ayurvedic medicine. It is a perennial plant indigenous to the tropical wetlands of Southeast Asia, where it is one of the most commonly used green leafy vegetables. Gotu kola is believed by alternative practitioners to have antimicrobial, antidiabetic, anti-inflammatory, antidepressant, and memory-enhancing properties. It is widely sold as a dietary supplement in capsule, powder, tincture, and topical formulations. Gotu kola is also known as marsh penny and Indian pennywort. In traditional Chinese medicine, it is referred to as ji xue sao and, in Ayurvedic medicine, as brahmi. Among alternative practitioners, gotu kola has attributed with many health benefits, ranging from the treatment of infections (such as the common cold, shingles, swine flu, and cholera) to the prevention of Alzheimer's disease, blood clots, and even pregnancy. Others assert that gotu kola can treat or prevent anxiety, asthma, depression, diabetes, diarrhea, fatigue, indigestion, and stomach ulcers. When used topically, gotu kola may help speed the healing of wounds and reduce the appearance of stretch marks and scars. Gotu kola has long been used as an herbal tonic to treat mood disorders and enhance memory. Although research results are mixed, there is evidence of some direct and indirect benefits. A 2017 review of studies published in Scientific Reports found little evidence that gotu kola directly improves cognition or memory, although it appeared to promote alertness and relieve anxiety within an hour of consumption. Despite its shortcoming, it is possible that gotu kola may indirectly affect cognition and memory. Being more alert and less fatigued will invariably improve a person working memory (i.e., short-term memory). Moreover, reduced anxiety and feeling of calmness will often translate to better concentration, memory retention, and information processing speed. Gotu kola appears to reduce anxiety by regulating the activity of neurotransmitters known as gamma-aminobutyric acid (GABA). Asiatic acid is the compound in gotu kola believed to trigger this effect. By influencing how GABA is absorbed by the brain, asiatic acid may be able to relieve anxiety without the sedative effect of traditional GABA agonist drugs like Ambien (zolpidem) and barbiturates. It may also play a role in treating depression, insomnia, and chronic fatigue. There is some evidence that gotu kola can improve blood circulation in people with chronic venous insufficiency (CVI). Venous insufficiency is a condition that occurs when the walls and/or valves in the leg veins are not working effectively, making it difficult for blood to return to the heart. A 2012 review of studies from Malaysia concluded that older people treated with gotu kola showed significant improvement in CVI symptoms, including leg heaviness, pain, and swelling (edema). These effects are believed linked to chemical compounds known as triterpenes, which stimulate the production of cardiac glycosides. Cardiac glycosides are organic compounds that increase the force of the heart and increase the rate of contractions. There is even some evidence that gotu kola may stabilize fatty plaques in blood vessels, preventing them from breaking off and causing a heart attack or stroke. Herbalists have long used gotu kola poultices and ointments to aid in wound healing. The current body of evidence suggests that a type of triterpene, known as asiaticoside, is able to stimulate collagen production and promote the development of new blood vessels (angiogenesis) at the injury site. A study from India found that a topical 0.2% solution of asiaticoside increased the production of hydroxyproline (a major component of collagen) by 57 percent while speeding the regrowth of tissue in puncture wounds. Claims that gotu kola can treat diseases from leprosy to cancer are largely exaggerated. These "cure-all" claims often shroud the actual benefits gotu kola may have in reducing disease risk. Gotu kola is known to have potent antioxidant effects, neutralizing many of the free radicals that cause cell damage at the molecular level. It has been theorized that these properties may provide protection against stomach ulcers and certain cancers. An early animal study from Jadavpur University in India reported that a gotu kola extract was just as effective in preventing stomach ulcers as the H2 blocker Pepcid (famotidine). Similarly, asiatic acid has been shown in research to induce apoptosis (spontaneous cell death) in certain types of cancer cells, particularly breast cancer. Although this effect has only been seen in test tube studies, it hints at a potential avenue for cancer drug development. Further research would be needed to substantiate these effects. In Southeast Asia, gotu kola is used as much for food as for medicinal purposes. A member of the parsley family, gotu kola is an excellent source of essential vitamins and minerals needed to maintain optimal health. Gotu kola is also a good source of dietary fiber, providing 8 percent of the RDI for women and 5 percent of the RDI for men. Gotu kola is a key ingredient in many Indian, Indonesian, Malaysian, Vietnamese, and Thai dishes. It distinctive sweet and bitter flavor and a slight grassy scent. Gotu kola is a central ingredient of one of Sri Lanka's most popular dishes, gotu kola sambol, which combine shredded gotu kola leaves with shallots, lime juice, chili, and grated coconut. It is also used to make Indian curries, Vietnamese vegetable rolls, and a Malaysian salad called pegaga. Fresh gotu kola can also be juiced and mixed with water and sugar to create the Vietnamese beverage nuoc rau ma. Fresh gotu kola is difficult to find in the United States outside of specialty ethnic grocers. When purchased, the lily pad-shaped leaves should have a bright green color without any blemishes or discoloration. The stems are edible and similar to that of cilantro. Fresh gotu kola is temperature-sensitive and can quickly turn black if your refrigerator is too cold. If not used immediately, you can place the herbs in a glass of water, cover with a plastic bag, and refrigerate. Fresh gotu kola can keep this way for up to a week. If chopped or juiced, gotu kola should be used immediately as it can quickly oxidize and turn black. Gotu kola supplements are available in most health food stores and shops that specialize in herbal remedies. Gotu kola can be taken in capsule, tincture, powdered, or tea form. Ointments containing gotu kola are available to treat wounds and other skin problems. Although side effects are rare, some people taking gotu kola may experience upset stomach, headache, and drowsiness. Because gotu kola can increase your sensitivity to the sun, it's important to limit your sun exposure and use sunscreen whenever outdoors. Gotu kola is metabolized by the liver. If you have liver disease, it is best to avoid gotu kola supplements to prevent further injury or damage. Long-term use may also induce liver toxicity. Also, be aware that gotu kola's calming effect may be amplified when taking sedatives or alcohol. Avoid taking gotu kola with Ambien (zolpidem), Ativan (lorazepam), Donnatal (phenobarbital), Klonopin (clonazepam), or other sedatives as this can lead to extreme drowsiness. Due to the lack of research, gotu kola supplements should be avoided in children, pregnant women, and nursing mothers. It is not known what other drugs gotu kola may interact with. How do you take a gotu kola supplement? There are no guidelines as to the appropriate use of gotu kola for medicinal purposes. Due to the risk of liver injury, the supplements are intended for short-term use only. Most manufacturers recommend no more than a 500-milligram dose taken twice daily for 14 days. Others believe that doses of up to 2,000 milligrams per day are safe and effective for treating occasional bouts of anxiety. What should I look for when buying a gotu kola supplement? Dietary supplements are not required to undergo the rigorous research and testing that pharmaceutical drugs do. Because of this, the quality can vary significantly. While many vitamin manufacturers will voluntarily submit their products for testing by an independent certifying body like the U.S. Pharmacopeia (USP). herbal remedy manufacturers rarely do. With respect to gotu kola, the plant is known to absorb heavy metals or toxins in the soil or water in which it was grown. This poses a health risk given the lack of safety testing, particularly with regards to imported traditional Chinese remedies. To ensure quality and safety, only buy supplements from a reputable producer whose brand name you recognize. If a product is labeled organic, check that the certifying body is one registered with the U.S. Department of Agriculture (USDA). If you're considering taking a gotu kola or medicinal purposes, speak with your doctor first. Self-treating a condition and avoiding standard care may have serious consequences. Chatterjee, T.; Chakraborty, A.; Pathak, M. et al. Effects of plant extract Centella asiatica (Linn.) on cold restraint stress ulcer in rats. Indian J Exp Biol. 1992 Oct;30(10):889-91. Chong, N. and Aziz, Z. A Systematic Review of the Efficacy of Centella asiatica for Improvement of the Signs and Symptoms of Chronic Venous Insufficiency. Evid Based Complement Alternat Med. 2013;2013:627182. DOI: 10.1155/2013/627182. Puttarak, P.; Dilothornsakui, P.; Saokaew, S. et al. Effects of Centella asiatica (L.) Urb. on cognitive function and mood-related outcomes: A Systematic Review and Meta-analysis. Sci Rep. 2017 Sep 6;7(1):10646. DOI: 10.1038/s41598-017-09823-9. Hashim, P. Centella asiatica in food and beverage applications and its potential antioxidant and neuroprotective effect. Int Food Res J. 2011;18(4):1215-22. Hsu, Y.; Kuo, P.; Lin, L. et al. Asiatic Acid, a Triterpene, Induces Apoptosis and Cell Cycle Arrest through Activation of Extracellular Signal-Regulated Kinase and p38 Mitogen-Activated Protein Kinase Pathways in Human Breast Cancer Cells. J Pharmacol Exper Therap. 2005;313(1):333-44; DOI: 10.1124/jpet.104.078808. Shukla, A., Rasik, A.; Jain, G. et al. In vitro and in vivo wound healing activity of asiaticoside isolated from Centella asiatica. J Ethnopharmacol. 1999 Apr;65(1):1-11.